Baking Soda Water: How Can It Benefit Us? While you may have thought that baking soda is only good for baking pastries, there are actually a number of other ways of using it. Baking soda can make your life much easier when dissolved in water. Several decades ago, baking soda was one of the major products used for treating stomach upsets and cleaning teeth. Today, there are plenty of alternatives, but baking soda is still a great natural remedy for you to become healthier and more beautiful. You can experiment with shampooing and shaving, treating minor cuts and burns as well as taking a relaxing bath. Now let's find out all the benefits of using baking soda water. Baking soda is a renowned antacid. It is capable of neutralizing acids, especially in the stomach. There are a variety of causes of chronic heartburn, or acid reflux disease. In some cases, the stomach acid can go up to the back of your throat. A first aid tip for this would be to drink some baking soda water. The baking soda will neutralize the stomach acid, hence easing the burning sensation you feel in your esophagus. The bubbles that form in the baking soda water will help relieve a bloated stomach and accumulated gas since they trigger burping. However, as mentioned earlier, this is only a first aid tip. If the reflux is recurrent, seek the help of a medical adviser. Baking soda is also considered as a mild antiseptic. This means it is capable of killing selected types of parasites, molds, fungi and bacteria. It means that you can disinfect the bristles of your toothbrush by sprinkling some baking soda on it, as well as clean your tongue, teeth and gums. Baking soda water will also aid in the reduction of chronic cough and sore throats. Bear in mind that baking soda water can only ease the symptoms, not cure the ailment. Alkalinity simply means the opposite of acidity. Baking soda can also be used to alkalize tissues. As much as acidity might be important in some parts of the body, like in aiding digestion, other body parts require certain levels of alkaline to function at their best. A good example is the blood. Only with proper amount of alkalinity blood can effectively exchange nutrients, oxygen as well as waste products. In addition, most of the microorganisms that cause disease cannot thrive in alkaline conditions. You can use baking soda as an inexpensive and efficient way to maintain proper alkalinity in the body. 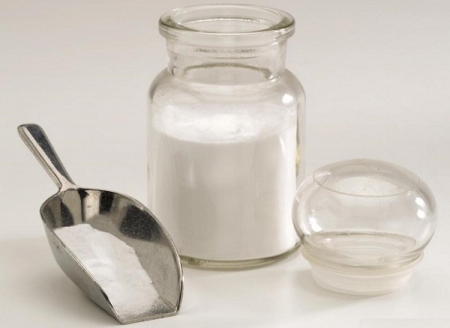 It is recommended to mix ½ teaspoon of baking soda with ½ glass of water to treat heartburn. People between age 5-age 60 can consume 7 dosages with 2 hours time space with 24 hours. People older than 60 years old should take no more than 3 dosages with 24 hours. You should avoid taking maximum dose of baking soda for over 2 consecutive weeks. For any severe discomfort, see your doctor. You can add a teaspoon of baking soda to your shampoo to have squeaky clean hair. The baking soda will help get rid of the accumulation of mousses, conditioners and sprays. You can also mix ½ teaspoon of baking soda with half a liter of water to get rid of the discoloration and dullness that occurs as a result of the chlorine in swimming pools. Baking soda is not only effective in neutralizing acids and odors of the foods, but also effective in your stomach. Neutral pH is 7 and baking soda’s pH is 8.1, making it good enough to help our body maintaining a neutral pH and act as a cleanser. It is important to note if baking soda is used as an antacid, you should take a half teaspoon of baking soda, mix it with 4 oz. of water and drink it every 2 hours. You should get the doctors opinion first and the dosage should not exceed 2 weeks unless otherwise instructed by a medical practitioner. When uric acid accumulates in your blood, urine, and tissues, a type of arthritis called gout occurs. As mentioned earlier, drinking baking soda water can balance the pH of your body. Some doctors might recommend bicarbonate of soda to balance acid level and treat gout. When using baking soda water, you must ensure that it is completely dissolved. You can ask your doctor about the dosage as well as the possible side effects. If you suffer from urinary tract infections, you might want to try out baking soda water. If you take 1 glass of water with completely dissolved 1 tablespoon of baking soda, the symptoms might be reduced. In some cases, the baking soda will help the body to fight the infection by reducing the acidity of the urine. Bacteria will often thrive in acidic environments. For this reason, many people tend to suffer from bladder infections due to the acidity in the bladder. You can overcome such infections by drinking baking soda water daily until the infection disappears. There are different dosages for this treatment, but it is safe to start with ½ teaspoon fully dissolved in one glass of water. Foods like lemon juice tend to corrode the enamel of your teeth. To protect your teeth, gargle baking soda water several times during the day or brush your teeth with baking soda toothpaste. If you don’t have the toothpaste, you can simply sprinkle baking soda on your toothbrush. If you have a painful sore throat, gargle baking soda water at least 4 times a day. It will neutralize the acid that is causing the pain. Make sure that the baking soda is fully dissolved in the water before drinking it. On the first day, mix ½ teaspoon baking soda with a glass of water and take 6 doses with 2 hour intervals. On day two, take the same mixture in 4 doses at the same intervals. On day three, take the same mixture twice a day. If you will not have healed by then, take a glass per day of the baking soda water till you get better. Considering the neutralizing powers of baking soda, it acts as a quick relief to ulcer pain as the stomach acid is neutralized. 1 or 2 teaspoons of baking soda fully dissolved in a glass of water, drink this mixture will ease the pain. If you get a splinter in your finger don’t struggle with it. Instead, just soak the part with the splinter in baking soda water. Do this twice a day and after a few days your skin will be as perfect as before. Instead of using creams that have a mixture of chemicals, go for a more natural relief. Mix ½ cup of baking soda in bathwater and then soak your body. Once you are done, instead of using a towel, let the water air dry. For a more direct approach, you can soak a towel in cold baking soda water to make a cold compress and then apply it directly on the sunburn. Another example of baking soda benefits is termed as "soda doping". This is done by athletes to improve their performance. A baking soda capsule is thought to have similar function as carbohydrate loading. However, you are advised not to try this at home. If you want to detoxify your body, soak yourself in a mixture of apple cider and baking soda. This will give you a spa-like bath, detoxing your body and easing all the pains and aches as well. Not only will you feel great, but you will have a very clean bathtub and drainage. Baking soda and baking powder are not substitutes. Do not confuse them. For average people, one shouldn't take more than 6 glasses of baking soda water in 24 hours and if you are over 60 years old, 3 is the top. Children below 5 years old should not take baking soda water unless under a doctor’s instructions. Do not take baking soda water consistently for more than 2 weeks. Choose baking soda that doesn't contain aluminum. Beware of the fact that baking soda can reduce mineral and vitamin content in your body, particularly folate, B vitamins and chromium. Baking soda is not suitable for people who are on a sodium restricted diet. Always make sure that the baking soda is completely dissolved in the water. If you are on any drugs, consult your doctor to see they will interact with each other. Baking soda water should be taken on an empty stomach. This should be between 1 and 3 hours before meals. If you take in baking soda in large quantities, you may experience diarrhea. Server responsed at: 04/25/2019 8:42 a.m.